Arriving four years after the original, Back To The Future Part II faced the difficult task of following one of the most beloved movies of the ’80s—a challenge it shared with Ghostbusters 2, also released in 1989. Neither film lived up to its predecessor, but Back To The Future Part II was much more successful than the Ghostbusters sequel and its psycho-reactive pink slime. That’s partly because it shifts focus. Whereas the original Back To The Future was, at its heart, a personal story about a kid learning to understand his parents, Part II is a straightforward time-travel adventure. Its shifting time-space continuum sends Doc Brown and Marty McFly to the future, then back to an alternate 1985, then back to the 1955 of the first film, with a trip to the Old West waiting in the wings. Although director Robert Zemeckis and screenwriter Bob Gale hadn’t initially planned to make a sequel, the success of Back To The Future made one inevitable. They originally wanted it to take place in the Old West, but they couldn’t figure out a simple way to take the story there from Back To The Future, which ended with Doc, Marty, and Marty’s girlfriend, Jennifer, heading 30 years into the future to tend to some unspecified family crisis. Getting to the Old West necessitated a third film—the weakest and lowest grossing of the trilogy, which prompted a fight with Universal about money. The studio relented, and the second and third parts of the series were shot simultaneously. The most exciting aspect of Part II leading up to the film was the sequence set in the distant future of 2015, and its flying cars, floating skateboards, and auto-lacing shoes. (Fax machines were still big, though.) Doc, Marty, and Jennifer travel there to prevent Marty’s son from joining a criminal caper with Biff’s grandson—Doc has done a 180 on his prior conviction never to alter the course of history, apparently—but while there, Biff steals the time machine and gives his 1955 self a sports almanac. The book makes Biff a wealthy sleazeball, changing the future; when Doc and Marty return to 1985, they discover Biff controls Hill Valley and has singlehandedly turned it into a cesspool of vice. From there they have to travel back to 1955 and get the book from Biff, all while reliving the events of the first film. The ending of Part II couldn’t help but feel anticlimactic, given that its only purpose is to set up Part III. In the theatrical release, the film ended with a montage of scenes from Part III. But as an expansion of the Back To The Future world, abetted by a crowd-pleasing bit of futurism, Part II works. We only have two years left to make double ties a thing though. 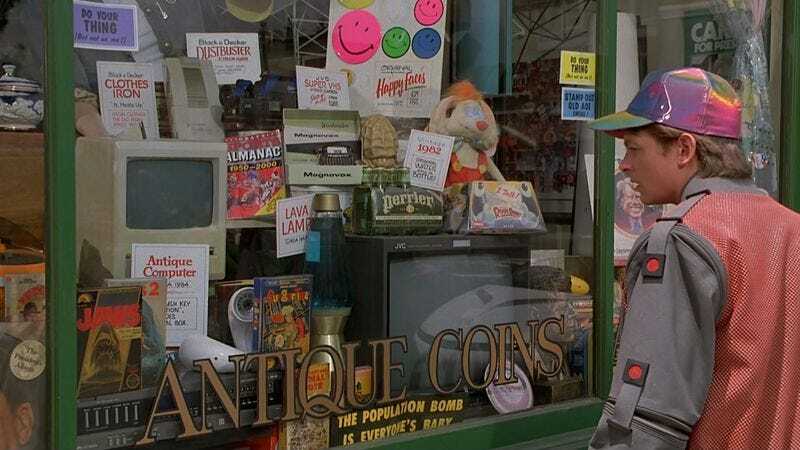 Availability: Back To The Future Part II is available on DVD, which can be obtained through Netflix, and to rent or purchase through the major digital services.